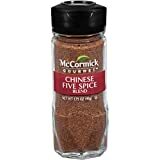 What is chinese five spice powder? About the ingredient chinese five spice powder. Including 98 recipes with chinese five spice powder, and where to find it. Five spice powder is used extensively in chinese cooking. This pungent mixture of five ground spices usually consists of equal parts of cinnamon, cloves, fennel seed, star anise, and szechuan peppercorns. 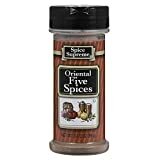 Prepackaged five-spice powder is available in Asian markets and most supermarkets. You can easily make your own from whole spices which results in a much fresher and significantly more flavourful spice mixture. See this: Homemade Five Spice Powder recipe for details on making your own five spice blend. 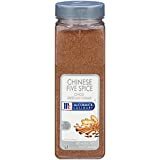 Chinese five spice powder is usually found in the spices section or aisle of the grocery store or supermarket. There are 99 recipes that contain this ingredient.